題名：Subventricular zone-derived oligodendrogenesis in injured neonatal white-matter in mice enhanced by a nonerythropoietic EPO derivative. Kojima T, Hirota Y, Ema M, Takahashi S, Miyoshi I, Okano H, Sawamoto K.
The subventricular zone (SVZ) of the adult brain contains neural stem cells that have the capacity to regenerate new neurons after various insults. Brain ischemia causes damage to brain tissue and induces neural regeneration together with angiogenesis. We previously reported that, after ischemic injury in mice, SVZ-derived neural progenitor cells (NPCs) migrate into the striatum, and these NPCs are frequently associated with blood vessels in the regenerating brain tissue. Here we studied the role of blood vessels during the neural regeneration in more detail. BrdU administration experiments revealed that newly generated NPCs were associated with both newly formed and pre-existing blood vessels in the ischemic striatum, suggesting that the angiogenic environment is not essential for the neuron-blood-vessel interaction. To observe migrating NPCs and blood vessels simultaneously in damaged brain tissue, we performed live imaging of cultured brain slices after ischemic injury. In this system, we virally labeled SVZ-derived NPCs in Flk1-EGFP knock-in mice, in which the blood vessels are labeled with EGFP. Our results provide direct evidence that SVZ-derived NPCs migrate along blood vessels from the SVZ toward the ischemic region of the striatum. The leading process of the migrating NPCs was closely associated with blood vessels, suggesting that this interaction provides directional guidance to the NPCs. These findings suggest that blood vessels play an important role as a scaffold for NPCs migration toward the damaged brain region. Huang, S., Hirota, Y. and Sawamoto, K. (2009).Various facets of vertebrate cilia: motility, signaling, and role in adult neurogenesis. Proc Jpn Acad Ser B 85: 324-336. 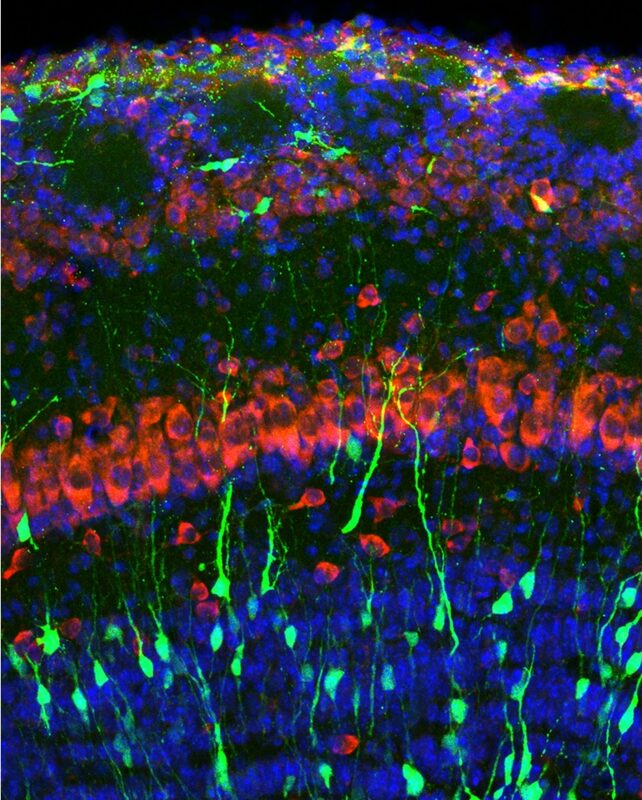 At the lateral wall of the lateral ventricles in the adult rodent brain, neuroblasts form an extensive network of elongated cell aggregates called chains in the subventricular zone and migrate toward the olfactory bulb. The molecular mechanisms regulating this migration of neuroblasts are essentially unknown. Here, we report a novel role for cyclin-dependent kinase 5 (Cdk5), a neuronal protein kinase, in this process. Using in vitro and in vivo conditional knock-out experiments, we found that Cdk5 deletion impaired the chain formation, speed, directionality, and leading process extension of the neuroblasts in a cell-autonomous manner. These findings suggest that Cdk5 plays an important role in neuroblast migration in the postnatal subventricular zone. The subventricular zone (SVZ) is the largest germinal zone in the mature rodent brain, and it continuously produces young neurons that migrate to the olfactory bulb. Neural stem cells in this region generate migratory neuroblasts via highly proliferative transit-amplifying cells. The Wnt/β-catenin signaling pathway partially regulates the proliferation and neuronal differentiation of neural progenitor cells in the embryonic brain. Here, we studied the role of beta-catenin signaling in the adult mouse SVZ. β-catenin-dependent expression of a destabilized form of green fluorescent protein was detected in progenitor cells in the adult SVZ of Axin2-d2EGFP reporter mice. Retrovirus-mediated expression of a stabilized β-catenin promoted the proliferation of Mash1+ cells and inhibited their differentiation into neuroblasts. Conversely, the expression of Dkk1, an inhibitor of Wnt signaling, reduced the proliferation of Mash1+ cells. In addition, an inhibitor of GSK3 promoted the proliferation of Mash1+ cells, and increased the number of new neurons in the olfactory bulb 14 days later. These results suggest that β-catenin signaling plays a role in the proliferation of progenitor cells in the SVZ of the adult mouse brain.